Photographer Justin Ng (Facebook.com/justinngphoto) captured the cones of Mount Bromo, Mount Semeru and Mount Batok during sunset and into the night. An amazing new video shot over 12 days by an amateur astronomer has captured the stunning beauty of an active volcanoes on Earth with the Milky Way galaxy as its backdrop. Photographer Justin Ng combined images of the moon, sun, Milky Way other celestial objects as they appeared over three volcanoes in Indonesia to create his first time-lapse video. 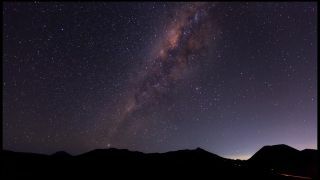 "My goal was to capture the beautiful Milky Way galaxy, star trails and sun rise along with the 3 volcanoes namely Mount Bromo, Mount Semeru and Mount Batok," Ng told SPACE.com in an email. Justin Ng is a photographer based in Singapore. He captured the images between May 26 and June 6 of 2012. Although Ng's video of volcanoes and the night sky is stunningly beautiful, it wasn't easy to capture. Trying to capture these shots in a tourist-heavy area like Mount Bromo also created a unique set of issues for the amateur astronomer, Ng said. A wind storm at around the 2-minute, 10-second mark in the nearly four-minute video collapsed some of photography equipment, but the cameras still managed to shoot about seconds worth of photos before falling over, he added. "As Mount Bromo is a famous tourist attraction spot, hundreds of jeeps can be seen during wee hours ferrying the tourists to the peak and back," Ng said. "Many of my clips were ruined due to light pollution caused by these jeeps. Also, I have to check the camera LCD screen frequently to prevent condensation issues from ruining my hours of effort and I have to battle against the strong wind from toppling my cameras." Ng cites luck as a major factor in the success of his trip to Mount Bromo. "Luck really played an important role to ensure the success of this film. I had to make important decisions everyday because I wouldn't have been able to capture some of the rare scenes if I did not visit the location when it happened," Ng wrote. "Post processing tens of thousands of shots to deflicker my clips was also a nightmare but the beautiful scenes I managed to capture made my efforts all worthwhile."